This says it rather well, doesn’t it? Dear reader, today, two hundred and forty-one years ago, a lovely woman by the name of Jane Austen was born. 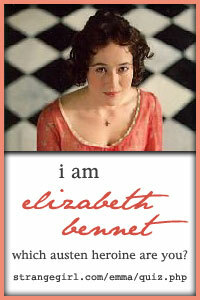 Without her, there would be no Emma, Persuasion, and–Heaven help us all–no Pride and Prejudice. In other words, we would not be “excessively diverted” every time we picked up one of her books, as they would sadly not be in existence. And so, today is a bit of a celebration of Miss Austen and her accomplishments. Put on a gown, brew some tea (Earl Grey, perhaps) make a cake–recipe follows–and, if you have the time, watch one of the most excellent movies based upon her books. Might I suggest the 1995 BBC version of Pride and Prejudice? If you’re as pressed for time as I am, you can watch Persuasion, but honestly, Pride and Prejudice wins in my book. I promised you a cake, didn’t I? Well, here goes; you may want to put on an apron. The following recipe is a pound cake. It was popular in Jane Austen’s day, so I thought it would make a nice birthday cake. Adjust an oven rack to the middle position and heat the oven to 350 degrees. Grease and flour and 8 1/2 by 4 1/2-inch loaf pan. Whisk the flour, baking powder and salt together in a bowl. Process the sugar, eggs, vanilla, lemon zest and lemon juice together in a food processor until the ingredients are combined, about 10 seconds. With the food processor running, add in the hot melted butter in a steady stream until it is incorporated. Pour the mixture from the food processor into a large bowl. Sift the flour mixture over the egg mixture in 3 additions, whisking to combine the ingredients after each addition until only a few streaks of flour remain. Continue to whisk the batter gently until almost no lumps remain. Try not to over-mix the batter. Scrape the batter into the prepared pan and smooth out the top. Wipe any drops of batter off the sides of the pan and gently tap the pan on the counter to release any air bubbles from the batter. Bake the cake in the oven until a toothpick in the center comes out with a few moist crumbs attached, about 50 to 60 minutes, rotating the pan halfway through the baking process. Let the cake cool in the pan on a wire rack for 10 minutes. Run a small knife around the edge of the cake to loosen it from the pan, then flip the cake out onto a wire rack. Turn the cake right side up and allow it to cool completely, up to 2 hours, before serving. You may wish to alert your local fire brigade should you add candles. And might I make a suggestion as to a pan you could use? It looks remarkably like the cake in the 2009 Emma. Recipe from One Dad’s Kitchen, originally from America’s Test Kitchen. Next Post Today in Pride and Prejudice-You Must Make Lizzy Marry Mr. Collins!